Here is an every day canvas tote you can use for groceries, books, workout gear or even as a gift bag! The canvas tote is 13" wide x 16" high x 3 3/4" deep. 24" corded handle. 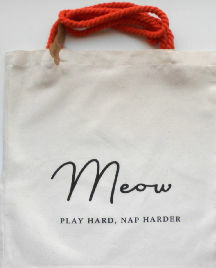 As the bag says: Meow PLAY HARD, NAP HARDER.